The home team collapsed a wee bit after the twin centuries. 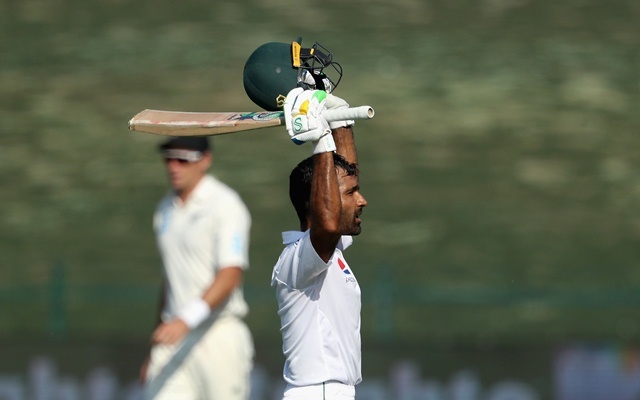 After bowling New Zealand out for 274, Pakistan, at one point in time, got themselves in a position of command in the final Test at Sheikh Zayed Stadium in Abu Dhabi courtesy of centuries from Azhar Ali and Asad Shafiq. However, the Black Caps made a strong comeback and bowled the hosts out for 348. At the close of play, the Kiwis are trailing by 48 with eight wickets left in the second innings. Shafiq and Azhar commenced proceedings with the score at 139/3 and carried on in their own merry way. The duo played out the entire pre-lunch session. They compiled a mammoth stand of 201 runs and also threatened to play the whole of the post-lunch session as well. They also took Pakistan to a lead of 12 runs. Azhar eventually racked up 134 runs from 297 balls with 12 boundaries. On the other hand, Shafiq scored 104 runs from 259 balls with 14 fours. Off-spinner William Somerville nipped out Azhar to break the partnership. A few overs later, Ajaz Patel accounted for the wicket of Shafiq. From a position of strength, all of a sudden, the hosts had two new men at the crease, Babar Azam and skipper Sarfraz, who had the responsibility of arresting the mini-slump. Babar, after scoring 14 with a couple of fours, became Somerville’s second victim. Bilal Asif couldn’t make an impact and fell prey to Patel’s guile and trajectory. Yasir Shah tried to stave off the bowling but succumbed to a shambolic run-out. In the same over, Hasan Ali also made his way back to the hut. Somerville picked up Sarfraz in the 135th over to put an end to Pakistan’s innings. Trailing by 74 runs, New Zealand came out to bat at the fag end of the day. Nevertheless, they didn’t have a memorable time in the middle, having lost two wickets for 26 runs. Left-arm teen sensation Shaheen Shah Afridi trapped Jeet Raval plumb in front for a 15-ball duck and drew first blood. In the 12th over, leg-spinner Yasir Shah got rid of Tom Latham. Somerville came in as the nightwatchman. Same Mistake Same Mistake !! This Shaheen Shah Afridi is going to be a handful on fast SA tracks if selected. It means he considered ball hit the pad first why?